After conducting my first sensory evaluation of a ripe puerh with one of my tea teachers last week, I followed up the experience with a tasting of La Colombe's Ancient Puerh. Yes, the well-regarded coffee roaster has a tea line, and their tea consultant is Alexis Siemons of Teaspoons & Petals. La Colombe's Tea & Tisane line which launched on September 6th, includes eight teas, five of which are (and two of these are tisanes) and three loose teas. Like La Colombe's Workshop single origin and blended coffees, the loose teas will be rotated. The arrangement between La Colombe and its tea provider, Rishi Tea, is a co-branding private label. 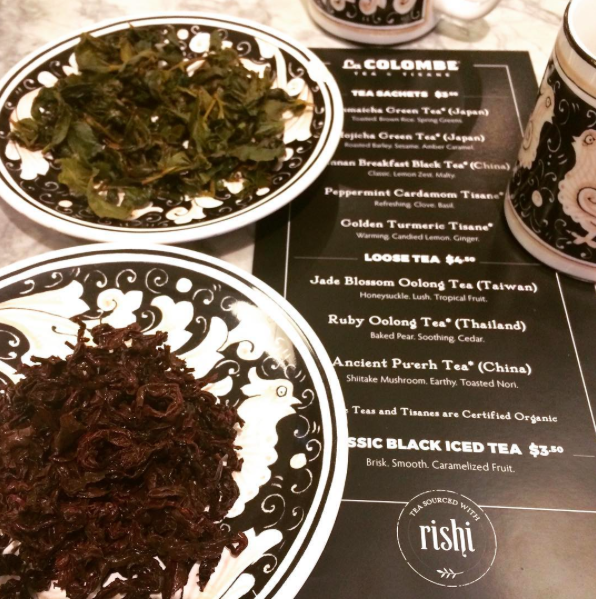 Although the teas were customized for La Colombe, you see the Rishi logo on many of the branding materials. How does a coffee company do tea well across its cafes? Every barista receives a two to three hour training. The sachet gram weights were designed for optimal steeping in La Colombe's 8 or 11 ounce cup sizes. The loose teas are prepared on dedicated Yama Silvertons. If you are not familiar with the Silverton, and I wasn't before my conversation with Alexis, it is a pour-over brewer that was originally designed to steep tea but was adopted by cafes to make pour over coffee. The infusion time for a loose leaf tea is approximately the same preparation time for a pour over coffee, so coffee drinkers inclined towards pour overs could more easily make the switch to loose teas especially with offerings like the Ruby Oolong or the Ancient Puerh, the latter of which is the topic of today's review. I steeped 5.5 grams of leaf in approximately 8 ounces of 212F water for 5 minutes. The first infusion had a nice depth to it. It was balanced with a dark chocolate sweetness. The second infusion was much bolder with more mushroom and soil notes but also a deeper sweetness composed of dark chocolate and molasses. There was a vegetal sweetness present, too. This shou puerh had the same energetic effect on me as did the ripe Palace Mo Hei from Teanami. Have you tried any of the teas and tisanes from La Colombe? I'd love to hear about your experience. Thanks to Alexis Siemons for this and other samples of La Colombe teas and tisanes.